On Monday morning, I headed to the Tomoka State Park in Ormond Beach to paddle the Tomoka River. I had attempted to paddle this river twice before, but I could never find the outfitter in—the drats for not bringing my own kayak with me. This time, I spoke to Billy by phone, and he was meeting me there. I wasn’t certain that I would like the Tomoka. 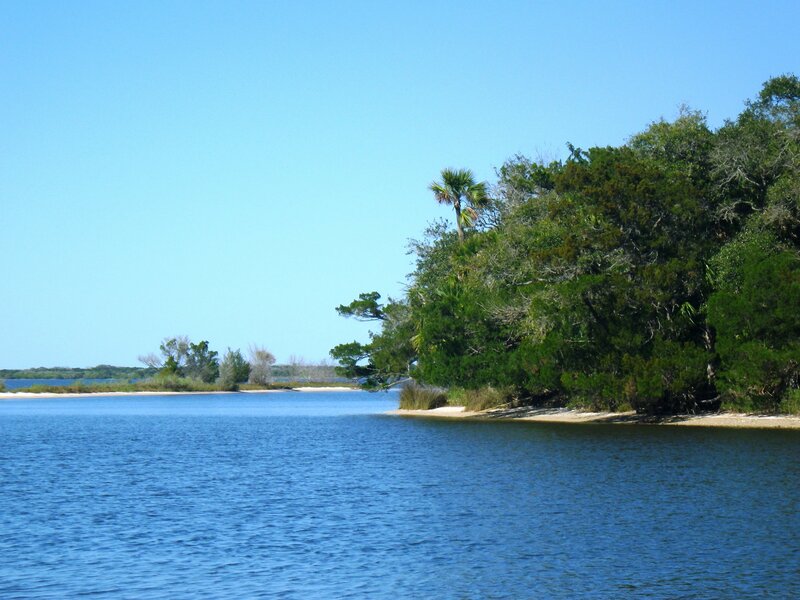 The state park “put in” sits at the northern end of the river, at the basin, right where the Tomoka connects to the Halifax River. The river is very wide here, so I knew it wasn’t going to be a sweet, canopied paddle. However, even with the cool winds on this morning, I could feel the sun warm me through my jacket. It was a beautiful day to paddle. From the put in, I had a choice to either paddle south, make a loop that would include Strickland and Thompson Creeks, and return, or to paddle north toward the Halifax. Although I liked the loop option (the river would be narrower), Billy suggested that with the winds and the movement of the current, I head north toward the Halifax. So, I took his advice, and I put in, staying close to the shore, and after about 15 minutes of paddling, I took a couple smaller waterways that headed back into the state park. These were both still pretty wide—60 feet or so—but I was sheltered some from the winds and could see both sides of the river. It turned out to be a lovely day on the river. Being Tuesday, the boat traffic was light; I saw only a couple small motorboats on the river. Within the first five minutes of my paddle, a dolphin graced the water a short distance in front of me. Fish jumped around me, taunting the few people casting lines from the shore. The state park brags a bird paradise, and I did see quite a few: herons (great, green, blue, and tri-colored), egrets, osprey, pelicans, kingfishers, and black-necked stilts. Heading into the waterways, tall salt grasses with a backdrop of cabbage palms and pines trimmed short sandy beaches. It turned out to be a quiet, lazy day on the river. I would return to the Tomoka, but I would paddle south and complete the loop to include Strickland and Thompson Creeks as well, or I might even try to put in at the FL 40 bridge and paddle north, provided, of course, I bring my own kayak. Either way, it’s bound to be a great paddle! Like your post. Nice way to R & R..it makes one want to venture out. The landscape, nature scenes must be beautiful and serene. Thanks. It’s the perfect way to connect, balance, and recharge! The rivers are amazing.